We couldn’t be more excited to have crafty blogger Brittany Jepsen of The House That Lars Built here with a new DIY tutorial for your home! 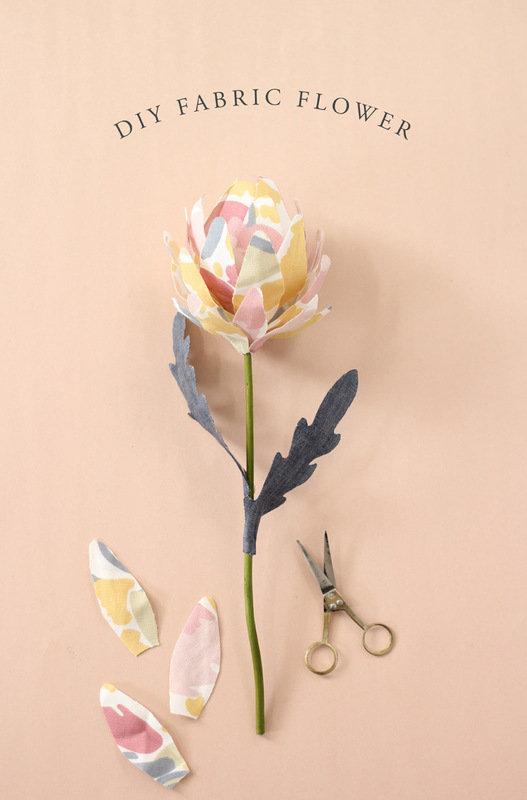 Read along as we see just how to create this elegant floral decor. With the onset of autumn comes non-fresh flower season. A tragedy, right? 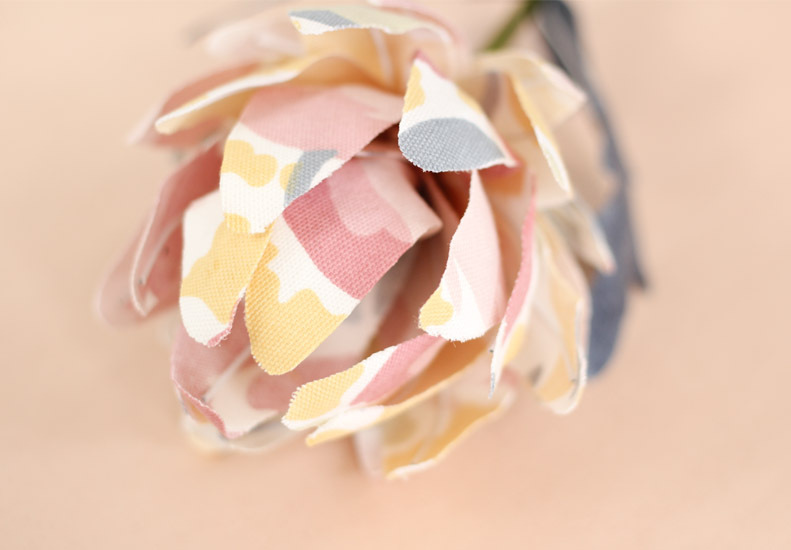 I found a remedy to this by working with some of my favorite Laura Ashley fabric to create this fabric flower inspired by autumn colors. By using fabric, you never have to water nor worry about the flowers dying. Score! Materials: Laura Ashley Emma Straw fabric, scissors, floral wire (we chose white), grey chambray fabric, green stick (we used a potpourri stick from Ikea), petal and leaf templates (download here), glue gun, wire cutters, Mod Podge, disposable paint brush, wax paper. 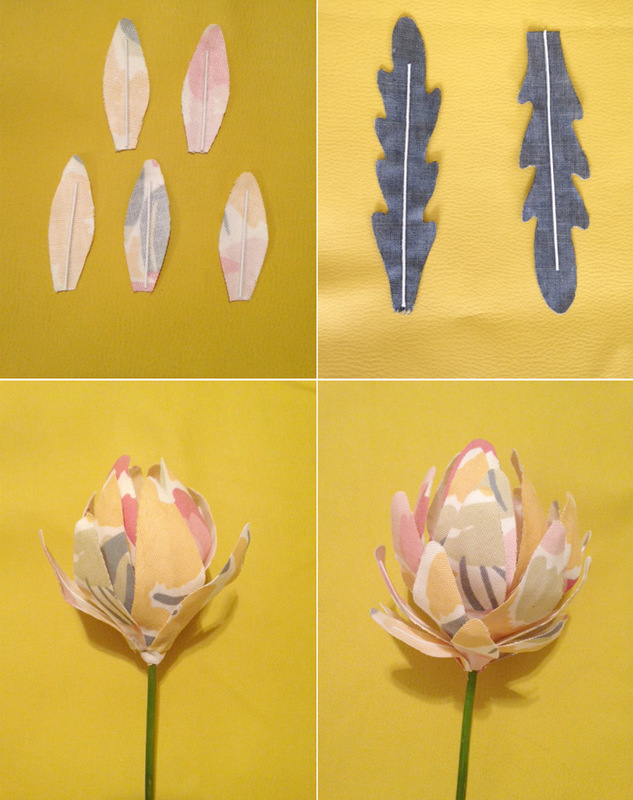 Cut out 7 of the small petals, 14 of the medium petals, 10 of the larger petals and 2 leaves out of the chambray. 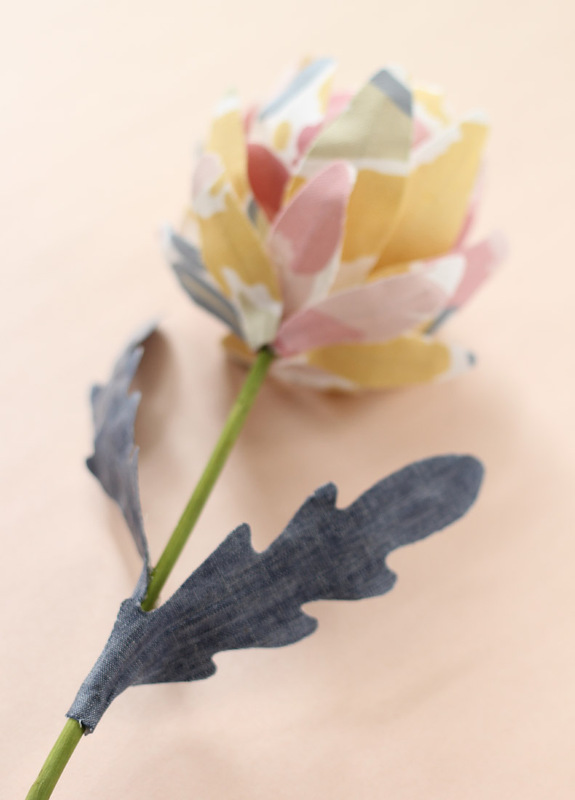 Place all fabric petal and leaf pieces on a sheet of wax paper, coating each piece with Mod Podge. Allow them to dry. Once dry, turn the pieces over and coat the opposite sides with Mod Podge. Glue a piece of wire to the back of each petal and leaves. Start by gluing the large petals evenly around the top of the stick and work your way down with the remaining medium petals. Use the smallest petals last, gluing them around the base of the bloom. Don’t worry about shaping them as you glue. 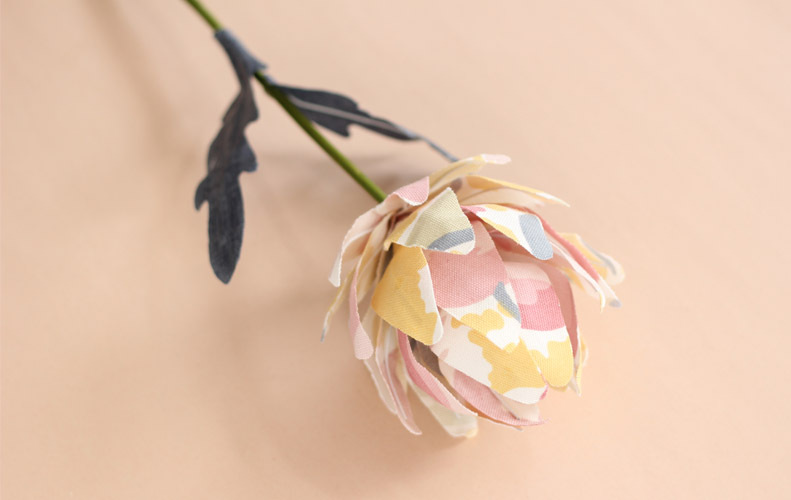 Once you’ve affixed the last petals, peel each petal back slightly to give it more form. Glue the leaves to the middle of the stick and bend them out. 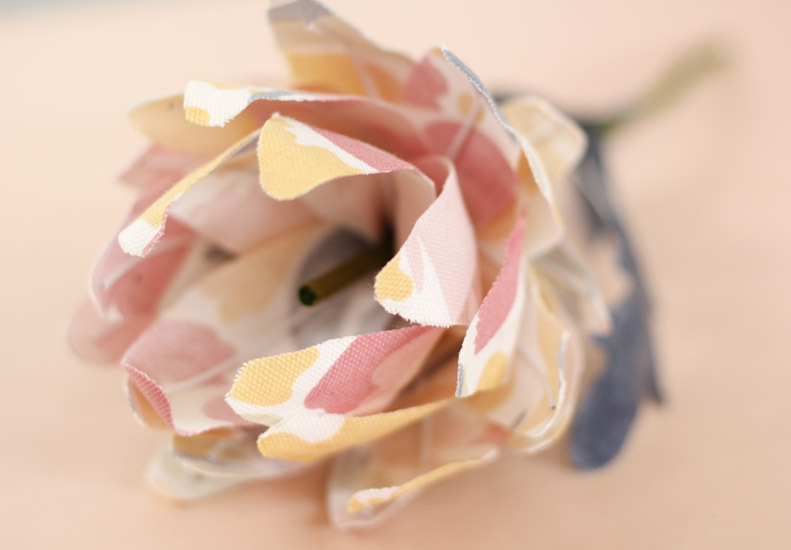 Unique and easily crafted, these fabric flowers would stand beautiful in a vase as a centerpiece or in a bedroom. 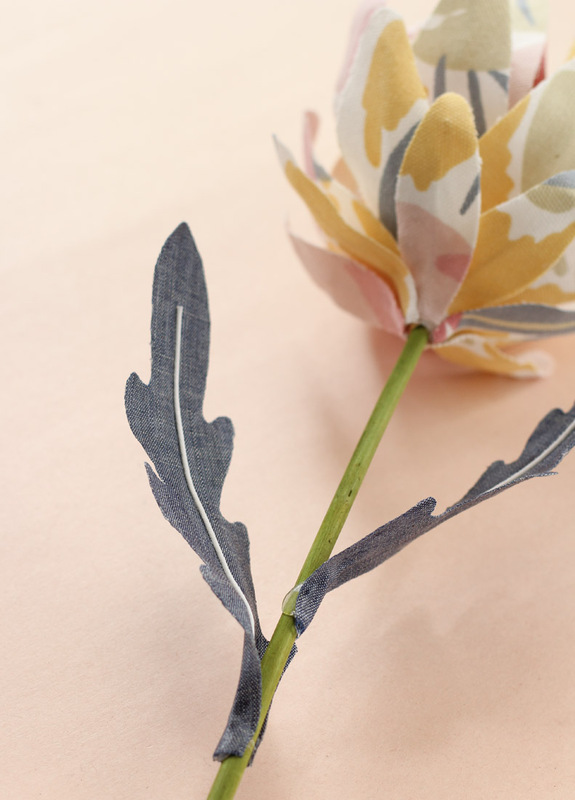 Tell us how you would incorporate fabric flowers into your home! For more of Brittany’s DIY projects, take a look at our Make & Do page. 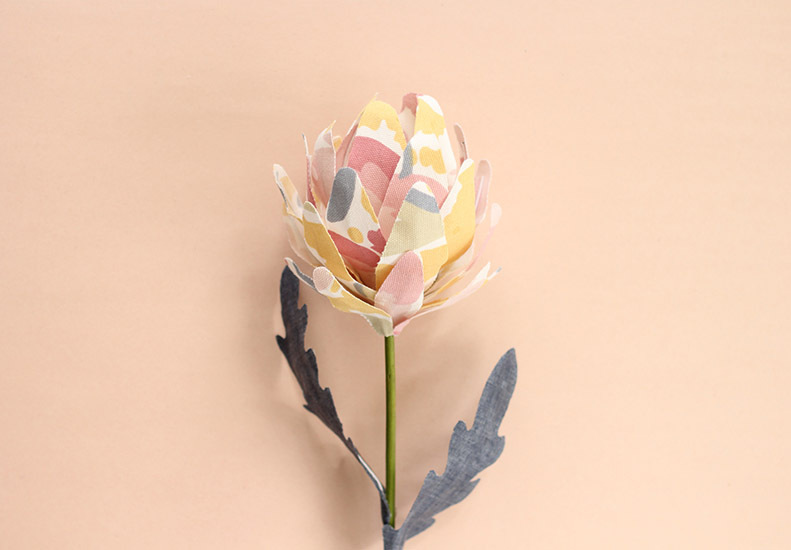 This entry was posted in Make & Do and tagged Autumn, brittany jepsen, centerpiece, diy, DIY Fabric Flower, emma straw fabric, fabric, Fall, floral print, flower, make and do, the house that lars built. Bookmark the permalink.